We have heard many self-help gurus including Brian Tracy, Anthony Robbins, Zig Ziglar, and more shared their success stories and how they use the power of writing their goals to realize their wildest dreams. If goal setting is so powerful, why not everyone achieves the goals that they set? Why did so many people write down their goals, yet fail to accomplish them? Do you achieve all the goals you set? Or do you fail to accomplish them? In my experience, goal setting works for me. I did achieve some of the goals I wrote down, but I have to be honest, there are many more goals that I failed to accomplish. What about you? Do you write down your goals and do you realize them? Or you are in the same position as me, you achieve some and fail at most of them? Regardless of whether we achieve our goals or not, I believe that the most important key is to discover why some goals work, while others do not. Many people have the wrong perception and think that they should set their goals only once a year. Due to how our calendar and days work, a lot of people come up with their new year resolution. And guess what happened after they set the resolution? They never revisit their goals and never think about them. I love what Tony Robbins said about goal setting. He said that goal setting is like any other skill, and that means you can learn and improve it. If you are a professional basketball player, would you train for just one day and then go for the competition? No, you will not do that. You will train every single day and do your best to improve your skill. And that is exactly what you need to do with setting goals too. You should do it and practice it daily. Nobody says that you can only set goals once and forget about them. Goal setting is a skill, and in order to master that skill, you must practice it daily. Therefore, don’t make this mistake and thought that goal setting is a one-time work. It is absolutely not. Do you know that Scott Adams, the creator of the Dilbert comic strip, said that before he became famous and successful as a cartoonist, he would practice writing down his affirmation (his goal) for 15 times a day? When you practice daily goal setting, you are creating the intention to achieve them. You are directly telling yourself and programming your subconscious to think that those goals are important and you want to achieve them, passionately! How many times do you review the results you get? Once a day? Once a week? Once a month? Or never? Reviewing your results is one of the most important jobs that will make sure you are achieving your goals, but unfortunately, most people don’t do it. And they wonder why goal setting is not working for them. Jobs understood the importance of reviewing his life, his decision, his actions and also his goals. This is why he asked that question so that he can live the life that he truly desires. If you knew you were on the last day, the last week, or the last month of your life, would you want to be doing the work you are doing now? Would you want the life you are living? If the answer is no, should you change something? How would you go about it? We should do the same. Review our results and our goals each day. Are you working on your goals? Are what you did today able to realize your goals? Are you moving forward each day? It works just like a GPS. You need to know where you are before you can set out and get to where you want to go. Without knowing your current position or if you are moving in the right direction, you can never reach your desired destination. Therefore, review your results each day. If you think that this is too much, do it at least once a week. You can choose a more casual day, ask yourself these questions and review your answers. Are you getting the results you want? Are what you doing now will realize your goals? Are you moving forward or falling behind? What should you change or do to move forward? These are life-changing questions that will transform your life. Never ignore them. This is a very common mistake on goal setting that most people will make. Instead of setting clear and specific goals, they set vague goals such as, “I want to be successful”, or “I want to be happy”. While it is true that you are creating the intention in your mind, but the results that you desire are way too vague and your mind cannot understand what exactly you want. And when your mind cannot tell specifically the result you want, it cannot engineer a solution or a plan to get there. Think about it, if you have no goals, have no intention, and don’t know what to do during the weekend, how do you think your weekend will turn out? Well, the answer is pretty obvious, you will sleep late, you will watch TV, play games, waste most of your time checking updates on Facebook, etc. And when your friends come to you and ask you out for a drink, highly likely, you will join them, right? Conversely, when you have a plan, say you want to write a 2,000 words article in the morning and you want to exercise in the gym in the afternoon, how do you think your weekend will turn out? Do you think that there is a high chance that you will follow your plan to accomplish your goals? You know the answer. Even when your friends invite you out, there is a high chance you are going to reject them because you know that you have some personal commitment to fulfill. The more clear and specific you are with your goals, the more intentional you will become. And because you planted the idea of reaching your goal and working on it in your head, you become more proactive rather than reactive. This is why it is important to be specific with what you want. Can you see the power in clarity now? Don’t say that you want to lose weight, instead, say that you want to exercise in the gym every Tuesday and Friday, for an hour, from 5pm to 6pm. This is a clear and specific actionable target that will eventually lead you to your ultimate goal, which is to lose weight. So make your goals actionable. Don’t just say that you want to be happy or you want to be rich, instead, associate actions into your goals. Make sure that they are something that you can do. Some people will suggest you write down as many goals as possible, but the truth is that as human beings, we tend to lose our focus when we try to accomplish too much all at the same time. Stop multitasking and stop chasing too many goals at the same time. It is always better to have one completed project than to have 10 incomplete ones. It is better to have a fully written book and get it published rather than having 10 that are still in drafts. A fully completed project has a bigger impact on your life than the incompletes. Thus, stop focusing on too many goals at once. Warren Buffett, one of the world’s richest men on planet earth once shared his focusing technique with his personal pilot, Mike Flint. When Mike discussed his career priorities with the billionaire Buffett, Buffett asked him to write down 25 of his most important career goals. Mike did it and then handed the list to Buffett. Buffett looked through the goals and requested Mike to circle the top 5 on the list. Mike cracked his head and tries his best to narrow down his goals into the top 5. At this point, Mike has 2 lists, one consists of his top 5 goals and the other consists of another 20 goals. Buffett then asked Mike what he should do about his lists. Without a doubt, Mike said that he should focus on his top 5 goals and spend the most time and effort there. As for the remaining 20 goals, he should work on them whenever he has the time. Warren Buffett is the CEO and also the chairman of Berkshire Hathaway and his company manages many other multi-national companies with billions of annual revenues. If Buffett suggested his personal pilot to focus on only 5 most important goals and ignore the rest, don’t you think this is something you should learn too? From now on, identify your most important goal and make sure you have less than five of them. Concentrate and put in 100% focus on achieving your most important goals first. And after you have achieved them, you can then turn your focus to other goals. This is another common mistake most people will make. They overestimate their ability and set goals that are way too big for them to accomplish. While it is true that some gurus will suggest you set big goals that will motivate you, but you should never overestimate your own ability. Please understand that your goals can make you or kill you. Success works in cycles. When you start small, you take the necessary action, you will see some result, you are happy with it, and this will reinforce your beliefs that you can do it. When you have a stronger and better belief, you will put in more potential and take more action. This will lead to more results. The opposite can happen when you try to achieve something too big or too much at the beginning. When you overestimate your own ability and try to accomplish goals that are way out of your current league, you will feel dejected whenever you did not produce the results you desire. Just like if you set out to earn $100,000 from your e-commerce website in 30 days, and if you did not achieve this goal, you will feel like a failure. This is a very common self-sabotaging phenomenon that happens to all those who overestimated their ability. Please, do not misunderstand by thinking that you should not set big goals. You have to understand for you to achieve big goals, you have to use a completely different blueprint. The plan that you created to earn $1,000 a month and the plan to earn $100,000 a month are totally different. Take blogging as an example. If you want to earn $1,000 a month, you can write consistently, monetize your blog with Adsense, recommend affiliate products or sponsor some articles and you will be able to hit the target. On the other hand, making $100,000 from your blog a month requires a completely different strategy. For instance, you need to transform your blog into an authority website through quality content, build your own email lists and grow your blog audience, set up marketing strategies through other platforms like guest posting on other blogs and leverage on social media for more exposure, etc. As you can see, different goals require different blueprints. The problem with most people is that they overestimate themselves by setting big goals that are out of their current ability to achieve, and at the same time, they are not using the right blueprint to achieve their goals. What most people will do when it comes to setting a big goal is that they will double their time and put in more effort into doing what they know at that moment. This is not going to work. And this is also why most people fail to achieve big goals. Hence, do not overestimate yourself. You can always start small and grow your knowledge, confidence and build stronger beliefs before you set bigger goals. If you want to go big, make sure you have the necessary resources and are using the right blueprint to get there. I’m not saying that you should not start with big goals that are out of your leagues. But if you are going to set big goals, just make sure that your action plan can get you there. Like I said, you can’t set a goal to earn $100,000 by implementing the $1,000 action plan. You are going to fail. I recommend you read my previous article, Setting Realistic VS Unrealistic Goals: What You Need to Know to understand better. Another common mistake that most people make when it comes to setting goals is that they have been influenced by others and they set other people’s goals. For instance, most people will set their goals to lose weight and to be financially free. Well, I do not know if this is exactly what you want, only you can tell. The problem is that if you are setting other people’s goals and your goals are not what you truly want, you will have a difficult time achieving them. Thus, stop being influenced by others and set a goal that you truly desire. This is your life and you should set a goal that will give you the feeling and experience. Too often, when we see our friends travel, buy luxury items, or change a new car on social media, we tell ourselves that we want that too. We are always being influenced by the people and the environment in our surrounding. So when it comes to setting a goal, choose to set a goal that you truly desire. Set a goal that will make you feel happy and excited when you think about it. Set a goal that connects with your dream, a goal that can spark your inner passion to make you live your best life. 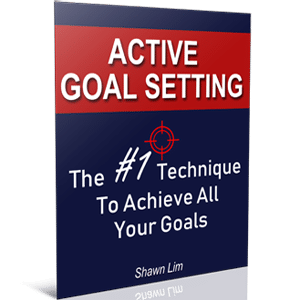 If you want to know whether you are chasing other people’s goals or if you are setting the goals that you truly want, you have to understand the “means goals” and the “end goals”. End goals are what you truly want. It is something that you want to experience and desire deep in your heart. For example, it could be traveling around the world and experience different cultures and enjoy the beautiful scenery. Means goals, on the other hand, are targets that will get you to your end goals. For instance, you want a certain job, a college degree, or earning $10,000 a month, or getting into a certain company, etc. Steve Pavlina has a very good simple explanation of this. He said, seeing your favorite music group performs live in concert is an end goal. You want to be there and enjoy that particular experience. Now, suppose a radio station is having a contest where the prize is two tickets to that concert, and you want to win that contest, this, my friend, will be a means goal. Winning the contest is not the final outcome that you desire. Winning the contest is the pathway to the concert, it is a means to an end. Begin with the end in mind. You have to understand that your means goals are there to guide and bring you to your end goals. What you truly want in life are the end goals, not means goals. When you spend most of your time and put in your effort chasing the means goals, you will feel exhausted and uninspired, because they are not the end outcomes that you want. This is why if you are working solely for the reason of earning money, you will never feel happy or fulfill because money is the means to an end. Are you working hard to realize your goals? Or do you just set them and wait for a miracle to happen? This is exactly what most people do. They set goals, but they are not doing anything about them. Please remember this, you are what you do, not what you say you will do. It is what you do now that truly counts. There is no point to sit and just thinking about becoming a millionaire and traveling around the world. Get up and make your goals a reality. Work on them. Les Brown often tells his seminars audiences, “Don’t stop running toward your goals”, and he is absolutely right. Nothing is going to happen if you choose to not do anything. Listen, goal setting will not work if you are not going to make it work. It will work when you are willing to work on it. Thus, whatever you do, keep running forward and taking action towards your goals. There will be days when you feel uninspired, tired, exhausted, and not wanted to do anything, but press on and keep on hustling. The difference between highly successful people and ordinary people is that highly successful people choose to take action even when they don’t feel like it. So don’t just set goals and do nothing. Create a plan and more importantly, act on your plan. If you always procrastinate and find that taking action is difficult and challenging, I suggest you learn the “mind hacking” method from The Procrastination Fix. The difference between someone who takes action and someone who doesn’t is the response and how their mind works. When you change your mind, you can change your habit. And procrastination will never be an issue anymore.